Fluoroscopy is an imaging process that allows veterinary professionals to view the inside of the body and study moving structures while the patient is in motion. This method of treatment, which can be thought of as providing x-ray movie footage, allows several images to be captured and projected on a viewing monitor in real-time. 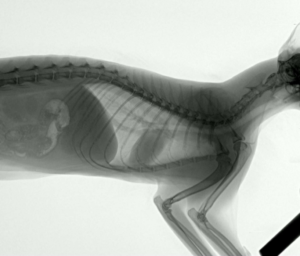 Fluoroscopy enables veterinary professionals to visualize how a substance is moving (or not moving) through the body. Oftentimes, an instrument or contrast inserted into the body can be seen in detail, as the fluoroscopy equipment generates a continuous stream of images using pulsed x-rays. Fluoroscopy has a wide variety of applications and carries benefits that far outweigh the risks of the technology to human or animal. Since fluoroscopy provides continuous or pulsed x-rays, it should be used at lowest acceptable exposure levels for as brief a period of time as necessary. What is veterinary fluoroscopy used for? Veterinary fluoroscopy is capable of providing real-time examination thanks to the advancements in imaging technology including: screen phosphors, digital image processing, image analysis, and detectors. Contact us at 516-513-1330 ext. 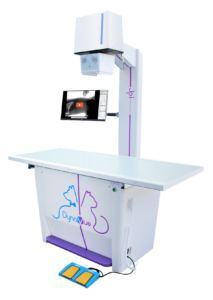 3 for more information regarding our veterinary fluoroscopy system.